Of the many words that one might choose to define Fetsum’s long awaited debut, perhaps the most accurate is ‘global’. It’s an adjective that not only summarizes the sound that he has fashioned since he first started writing in his early teens, but also his background. 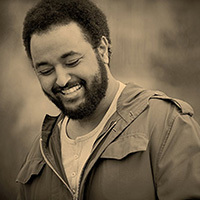 Fetsum’s parents were Eritrean revolutionists during the country’s thirty year War Of Independence, and he was born in Egypt after his 16 year old mother became a casualty of the fighting in her homeland when she was four months pregnant. Within 18 months they had moved to Italy, where he lived for the next two to three years, before heading on to Stuttgart, Germany, where his aunt had also been forced to flee while seeking asylum from the war. Initially they only planned to help her settle before returning to Italy, but they ended up staying, and it was during these formative years that Fetsum’s musical interests began to develop.